Minnesota goes wild in spring when it finally gets warm, and so today, which promises to touch 70 degrees, will surely display this. Like the day described in today’s episode, I’ll probably go for a bike ride with my young son, and we’ll ride on The Greenway, a several mile reclaimed railroad cut that runs, as time does, east and west through the middle of Minneapolis. Raising a child as a musician, writer, and sometime bohemian brings extra questions. Do you want your child to follow the most conventional and unquestioning path? Certainly not. You encourage him to question things, even allowing that this will encourage him to question you. You look at your own life backwards as you look at his coming forward, and wish him adventures, but only so much. You know there will be hardships and wrong choices, but you hope only enough to be instructive. As an artist you may worship art, but you’re not sure you’re comfortable with him adopting all the tenants of that religion. Today’s piece “Biking on the Greenway with My Son and Bob Stinson” speaks of this from the seat of a bicycle. Bob Stinson was the animating force in The Replacements, an ‘80s punk band that never tried to split the difference between insouciance and not giving a @#*&. As a guitarist he was an anarchist, and the band accidentally worked like the NY Dolls, the Kinks, or the Rolling Stones, with a great front man who had the lyrical wit and the staggering lead guitarist who embodied the music’s soul. The Replacements sit and wait for The Greenway bike path to come through. Bob Stinson, middle left. The guy on the left is an artist. The guy on the right played in Guns and Roses. The guy on the middle right, writes songs. The Replacements’ front man, Paul Westerberg, was quickly indicted as a fine rock’n’roll songwriter, which damaged the band because songwriting implies loitering with intent to commit James Taylor. The band rebelled by making sure that a regimented presentation of a set of songs was not the aim. On any given night, this could be inspiring or a shambles: Dada or do-do. Being blotto on stage to the point you couldn’t hide it was almost a requirement, and for no member of the Replacements more than for Bob Stinson. Eventually the dichotomy demanded an ostomy, and Bob Stinson was asked to leave the band he founded. Things did not go well for Bob without his artistic outlet, and chemical dependency played out its run until he died, his body worn out at 35. Self-destruction aside, you can see that as path of purity. Chasing after success and an ego-driven desire to rise above others can harm too. The addict and the monk believe they have two different gods, but they have the same scourge. Negation and creativity; the not this, so this can emerge, is part of the religion of art. Music, Minneapolis, and life are different now 30 years later, and that’s the place my son now lives in. Somewhere 30 years on from today will be the place he will live in, no longer young, if he survives rebellion and conformity, if he finds the balance between the worship of the self and self-destruction. 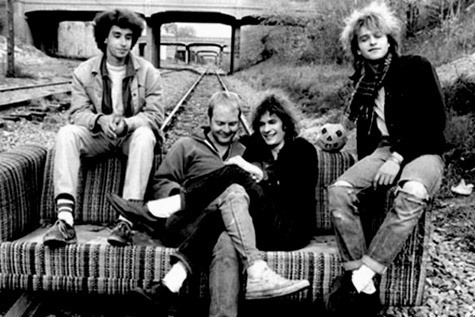 This is National Poetry Month, so in the spirit of the Replacements, this is a post more about music, and the music in “Biking on the Greenway with My Son and Bob Stinson” is not all that polished, tossed off by the LYL Band in one take. Still you might enjoy clicking on the player below and listening to it.